From the event, via Mourad’s Facebook fan page. 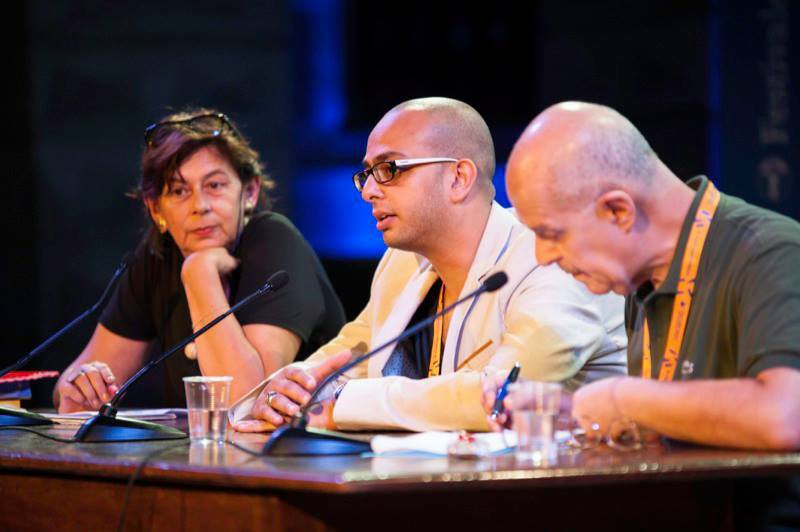 The last day of the seventeenth edition of the Mantua Book Festival saw the presence of young Egyptian writer Ahmed Mourad, introduced by Arabist and literary translator Elisabetta Bartuli, of the Cà Foscari University of Venice. Mourad and his books attracted many people to the event held in the beautiful city of Mantua, once ruled by the Gonzaga noble family. Speaking in a quiet and pleasant tone, Mourad does not really look like the classical and experienced thriller writer that he is. One could say that, despite his age, he is one of the pioneers of this genre in Arabic, as the genre suffers from a lack of pure detective stories, namely those books where the detective hunts the criminal. Mourad said that he chose to write thrillers because he felt that this genre was the closest to the Egyptians’ daily lives. By reading crime news in the newspapers, or going through crime cases, the Egyptians have developed practical minds and a detective-like intuition. This is also the reason why, in Mourad’s books, the common people, and not the police, solve the cases. Talking about the police, Mourad stated that among the “sparks” that brought about what he called “the first revolution” were the injustices perpetrated by the police. That same force who, during the last year when the Muslim Brotherhood was in charge, made the same mistake by allying with and supporting MB’s pervasive power. However, according to Mourad, today Egypt is witnessing a new phase where the people joined forces with the Army and the police. Speaking about Mourad’s books Vertigo and Polvere di Diamante, the reader might notice a difference: In the latter, the writer shows a greater maturity and there is also a more outspoken complaint/denunciation of the country’s problems. While Vertigo‘s main character Ahmad resembles his namesake author Mourad (at his first try as a writer, Mourad preferred to write about a reality he knew well) who can be defined as a “pure-hearted rebel,” Taha reacts to injustices in a more brutal manner. This same evolution — which is also evident if one compares the main female characters, Ghada and Sara — goes in parallel with the change Egypt went through. Mourad’s second book was released in Cairo only a year before the 2011 protests, and one can “smell” in it the society’s anxiety to change things, the author said. Ahmed Mourad is not only a writer, but also a photographer, a screenwriter and a graphic designer: This versatility, shared with many other artists of his generation, is linked to the cultural excitement witnessed by Egypt for at least a decade, during which the Mubarak-led regime loosened its grip over the country and the virtual and real activism gained some space. Mourad was very enthusiastic about having the chance to write in such a rich and lively moment of Egypt’s history, a moment in which the readers require writers to record and testify to history in their works. “With the written word, Egypt will be born again,” Mourad affirmed in Mantua, and in saying so acknowledged the contribution to the changes in Egypt made by the intellectuals of his generation. He also added that he would like to experiment other artistic means — like playing an instrument if only he knew how! — to further contribute to his country. Bartuli and Mourad also discussed the role of the written texts in society: Do they have a real impact on it? The writer gave to the public a couple of examples: In Dubai there are unlimited possibilites for a book to get published and promoted but, at the same time, there is a lack of writers – said he with a smile. As for Europe, when he was touring the UK to promote the English translation of Vertigo, he got the impression that people there read a lot, while in Italy, he added, people might read as little as in Egypt. However, seeing the number of young people volunteering at the festival, he said to be very optimistic about the future…of both countries. The young author replied that it is just a matter of professional ethics: only by being detached can a photographer freeze those instants that will become fundamental moments in a country’s collective history. He also said that he had given Mubarak some free copies of his books — apparently the former ra’ees did not get their message! The event took place in the magnificent Teatro Bibiena, the same location where a couple of years ago Palestinian poet Mahmoud Darwish and Italian actor Franco Lombardi performed Darwish’s famous poem “Mural” in Arabic and Italian. The same show was organized in many other cities including Siena, where this video was recorded live. This first appeared on Editoriaraba.